This recipe comes from our lovely friends at The Department of Breakfast. 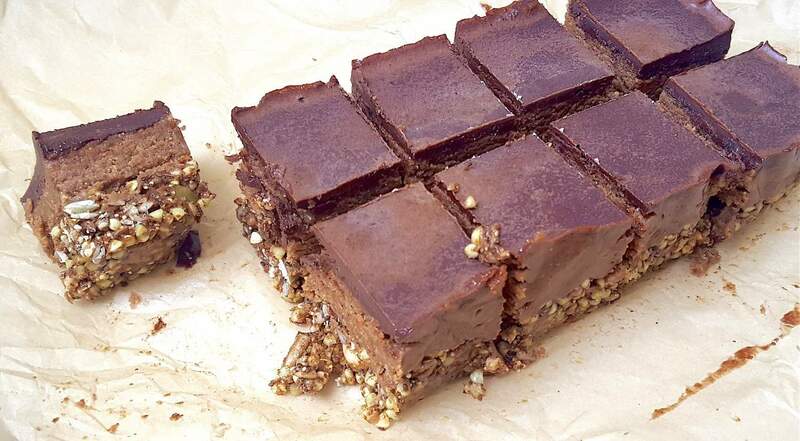 These delicious Raw Chocolate Caramel Slices are made with their Cacao and Goji crunch. Starting with the base, add the almonds and pecans to a food processor and pulse until broken down to a crumbly consistency. This should only take around 30 seconds. Next, take a pouch of The Department of Breakfast Cacao & Goji Granola and mix with the nut mix and date syrup. (Note, if you are using whole dates, add to a food processor with a splash of water and blend until silky smooth with a syrup like consistency – add more water if it gets too thick). Grease a 6×3 loaf tin with coconut oil and press the mixture down evenly until snug and compact. Put in the freezer to set for 30 minutes. On to our favourite layer, the caramel – it smells like heaven! Melt the almond butter with the date syrup (or date and water mixture as above) and the unrefined liquid sweetener on very low heat. Once combined, take off the heat and pour over the base in the loaf tin. Add back into the freezer to set the layer. Whilst the first two layers are setting in the freezer, move on to the final layer. On very low heat melt the cacao butter, coconut oil and the unrefined liquid sweetener until smooth. Add the cacao powder and vanilla essence and stir until silky smooth. If you like your chocolate on the milkier side, leave to cool for a few minutes and add a splash of coconut milk. Note, if you do this when the sauce is too hot, it will curdle. Once the caramel layer has set, remove from freezer and pour the chocolate sauce on top. Smooth evenly and pop back into the freezer for another 15-20 minutes. Once completely set, remove from the freezer, leave for a few minutes to warm up slightly and cut with a sharp knife. Enjoy! Want to discover more nutritious recipes? Follow us on Instagram!